Corinne welcomes you to the small town of Vouvray, in the heart of the Loire valley, where her typical touraine-style house is located. The 18th century house hase been completely restored by her owner to create a refined atmosphere while maintaining the spirit of the place, such as the troglodyte cave where the breakfasts are served, that was originally used to extract the juice of the grapes during the wine production. As a result, all the guestrooms are individually decorated and comfortably fusnished. 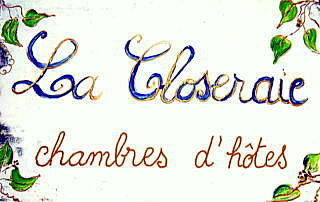 La Closeraie is a nice and quiet place to stay and visit the city of Tours, the Touraine vineyards and the numerous splendid châteaux of the Loire such as Amboise, Chenonceau, Ussé, Chambord and Chaumont sur Loire to mention but a few. The guesthouse has been selected by several guides, among which "The Routard", "Gault Millau" and "Petit Futé".